Started in 2011, M.A.D ("Maximum Active Dermaceuticals") Skincare blends the best science and nature offers to deliver the most advanced, potent skin care products on the market today. Each uses a narrow focus approach that delivers high potency products with the ability to address all 6 skin concerns. This is a critical path to success because it enables M.A.D Skincare to provide a multi-skin concern product line flexible enough to deliver a targeted solution at any point in the treatment process. As your needs change, M.A.D Skincare has the solution. See how M.A.D Skincare is "Blending Nature for Beautiful Skin". M.A.D ("Maximum Active Dermaceuticals") Skincare has formulated this light weight multi-stem cell, multi- peptide infused complex to protect, hydrate and nourish critical areas around the eyes. 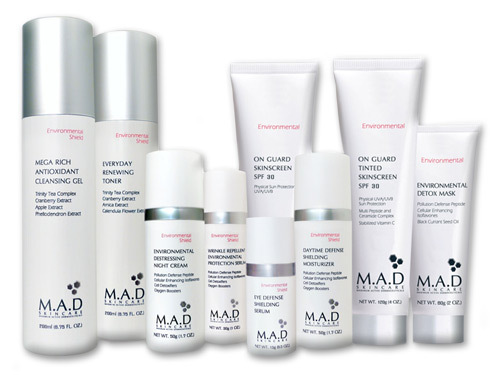 A great choice in your anti aging regimen from M.A.D ("Maximum Active Dermaceuticals") Skincare! Use this multi- stem cell and multi-peptide technology infused serum and your skin will feel hydrated, moist, plump, nourished and recharged. Maintain healthy young skin with Youth Transformation Glycolic mask from M.A.D ("Maximum Active Dermaceuticals") Skincare. Your skin's elasticity will increase, fine lines and wrinkles will be minimized, your skin will feel moist and hydrated. M.A.D's Transforming Daily Moisturizer is a light weight multi-stem cell, multi-peptide infused complex designed to make you look your best and return a more refreshed, healthy look to the appearance of your skin. M.A.D ("Maximum Active Dermaceuticals") Skincare has developed an effective exfoliation without the typical irritation from Glycolic Acid. A superbly balanced toner designed to maximize the exfoliation process in a unique easy to use toner. A light weight, nourishing, shielding day time moisturizer delivers Cell Detoxifiers, Oxygen Boosters and Peptides to protect your skin cells leaving it quenched but not greasy, nourished and fortified to start the day. Your environment is more damaging to skin than ever, with pollution, stress and poor diet contributing to premature aging. Protect and nourish your skin with this rich botanical serum for a healthy look that will last. A penetrating overnight mask designed to invigorate your skin at the cellular level, delivering botanicals to help give a burst of radiance to dull tired skin. Non-drying, balancing, nourishing, quenching, a toner like no other. Feel the difference when you apply M.A. Dermaceuticals' Everyday Renewing Toner, optimizing your skin for treatments that will deliver the best possible results. Page displayed in: 1.3164 seconds.